This article is about the city. For the electoral district, see Guelph (electoral district). For other uses, see Guelph (disambiguation). Guelph (/ɡwɛlf/ ( listen); Canada 2016 Census population 131,794) is a city in southwestern Ontario, Canada. Known as "The Royal City", Guelph is roughly 28 kilometres (17 mi) east of Kitchener and 100 kilometres (62 mi) west of Downtown Toronto, at the intersection of Highway 6, Highway 7 and Wellington County Road 124. It is the seat of Wellington County, but is politically independent of it. The city is built on the traditional territory of the Mississaugas of the New Credit First Nation. The current Guelph began as a settlement in the 1820s, started by John Galt, originally from Scotland, the first Superintendent of the Canada Company. He based the headquarters, and his home, in the community. The area – much of what became Wellington County – had been part of the Halton Block, a Crown Reserve for the Six Nations Iroquois. Galt would later be considered as the founder of Guelph. Because of its relatively low crime rates, clean environment and generally high standard of living, Guelph is consistently rated as one of Canada's best places to live. Guelph has been noted as having one of the lowest unemployment rates in the country throughout the Great Recession. In late 2018, the Guelph Eramosa and Puslinch entity had an unemployment rate of 2.3 per cent and that decreased to 1.9 percent by January 2019, the lowest of all Canadian cities. The national unemployment rate was 5.8 percent. Much of this achievement is because of the great number of manufacturing facilities, including Linamar. For many years, Guelph ranked at or near the bottom of Canada's crime severity list. By 2016, the data was less impressive although Guelph was below the national average in some important aspects. The 2017 Crime Severity Index showed a 15% increase from 2016. John Galt, the first Superintendent of the Canada Company, was hired to help colonize Upper Canada. He selected Guelph as the headquarters of this British development firm. Galt was a popular Scottish poet and novelist who also designed the town to attract settlers and farmers to the surrounding countryside. His design intended the town to resemble a European city centre, complete with squares, broad main streets and narrow side streets, resulting in a variety of block sizes and shapes which are still in place today. The street plan was laid out in a radial street and grid system that branches out from downtown, a technique which was also employed in other planned towns of this era, such as Buffalo, New York. The initial founding was symbolized by Galt (with "Tiger" Dunlop, who would be significant in the history of Goderich, Ontario,) felling a tree on April 23, 1827. That was St. George's Day, the feast day of the patron saint of England. The name Guelph comes from the Italian Guelfo and the Bavarian-Germanic Welf. It is a reference to the reigning British monarch at the time Guelph was founded, King George IV, whose family was from the House of Hanover, a younger branch of the House of Welf sometimes spelled as Guelf or Gwelf. The town was named to honour Britain's royal family, the Hanoverians, who were descended from the Guelfs, the ancestral family of George IV, the reigning British monarch; thus the nickname The Royal City. The directors of the Canada Company had actually wanted the city to be named Goderich, because Lord Goderich had helped form the company, but reluctantly accepted that the village was called Guelph. By the fall of 1827, 70 houses had been built, though some were primitive. In that year, the community had hired its first police constable; the first police station would be opened in 1856 at the town hall and it would move in 1900 to the Annex building behind the court house. Also in 1827, the first Guelph Farmers' Market was built; the Market House was located in the downtown area. The first Board of Commerce also started in 1927, to stimulate economic growth; in 1866, it would be renamed the Board of Trade, and in 1919, it became the Chamber of Commerce. In order to eliminate the need for farmers to take their grain to Galt or Dundas for grinding, the Canada Company built the first grist mill; the Guelph Mill was sold to William Allen in 1832. In 1829, the Canada Company fired Galt because of poor bookkeeping and not obeying company policies. He returned to Great Britain penniless and was imprisoned because he was unable to pay his debts. In 1831, Guelph had approximately 800 residents. For several years, the economy of the village suffered and some residents moved away; relief came in the form of wealthy immigrants from England and Ireland who arrived in 1832. The Smith's Canadian Gazetteer of 1846 indicates that the town had a jail and court house made of cut stone, a weekly newspaper, five churches/chapels and a population of 1,240; most were from England and Scotland with a few from Ireland. In addition to many tradesmen, the community had 15 stores, seven taverns, and some industry, tanneries, breweries, distilleries and a starch factory. The Post Office was receiving mail daily. 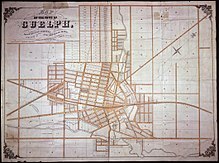 Guelph was incorporated as a town in 1855, with John Smith as the first mayor. Despite optimism, the population growth was very slow until the Grand Trunk Railway reached it from Toronto, en route to Sarnia, in 1856; the town was also served soon thereafter by the Great Western Railway branch from Harrisburg. In 1856, the village became a town. Two years later, the population was estimated at 4,500, up from 2,000 in 1853. The first city hall, now called the Old City Hall (Guelph), was built in 1856 of Guelph stone; the building contained a market house, offices and an assembly hall. Modifications were made in 1870, 1875 and 1961. The new Guelph City Hall opened in 2009 beside the older building which was declared a National Historic Site in 1984. The national document refers to the historic building as being "in the Italian Renaissance Revival style". The board of the Guelph General Hospital was incorporated in 1861, with James Massie as the chairman. The building was completed in 1875, at the cost of $9,871, and opened on August 16, 1875, with 2 beds, a small infectious room and a dispensary. The Gothic Revival style Roman Catholic church on Norfolk St., called the Basilica of Our Lady Immaculate since 8 December 2014, was built between 1876 and 1888. By 1869, the community's manufacturing companies were served by both the Grand Trunk Railway and the Great Western Railway. The first section of the Wellington, Grey & Bruce Railway, between Guelph and Elora, Ontario|Elora]], opened in 1870; the line would eventually run as far as Southampton, Ontario with stations in communities such as Palmerston, Harriston, Listowel and Wingham. This company was not very successful and never did reach Owen Sound as planned, partly because of stiff competition from the Northern Railway of Canada as well as the Toronto, Grey and Bruce Railway. By the mid 1870s, the Wellington, Grey & Bruce Railway was in financial trouble; it eventually became part of the Grand Trunk system, and later, the Canadian National Railway. By January 1871, some residents of the town had access to gas, provided by the Guelph Gas Company via pipes, initially to about 100 homes. Electricity would not become commonly available until the early 1900s, from the Guelph Light and Heat Commission. An 1877 plan to start the Guelph Street Railway, using horse-drawn vehicles to deliver freight and passengers within Guelph, never came to fruition. A poor house with a farm, The Wellington County House of Industry and Refuge, opened in December 1877 in a rural area near Guelph; many orphans from Guelph were admitted. The building still stands, as the Wellington County Museum and Archives. Guelph was incorporated as a city in 1879 with a Special Act of the Ontario legislature. At that time, the population was about 10,000. During the inaugural, Mayor George Howard first used the term Royal City. The only "royals" to actually visit were John Campbell, the Marquis of Lorne, and his wife was Princess Louise, Duchess of Argyll, one of Queen Victoria's daughters. A few years later, George Sleeman Sr. founded an electric radial railway, the Guelph Railway Company, an important part of the history of Guelph Transit. Only five miles of track had been laid by 1895, but the line was extended in 1902; the radial railway eventually reached Toronto, as the Ontario Hydro Electric Railways - Guelph District (owned by Ontario Hydro). In addition to carrying passengers, the cars carted coal to heat the Ontario Agricultural College. By 1886, telephones were quite common in the city. An April news article described the situation as follows. "Telephones are rapidly being introduced into private homes, where they prove a great convenience. Ladies order their groceries, consult their medical advisers, call their husbands home from the club and gossip with their friends by telephone." The Wellington County Jail (in Late Gothic Revival Style) and the Governor's Residence (in Georgian style) at 74 Woolwich Street were built in 1911; they were designated by the city for "historic and architectural value" and as a National Historic Site in 1983. The property is now an Ontario Court of Justice. The Canadian Communist Party began as an illegal organization in a rural barn near Guelph on May 28 and 29, 1921. Guelph was home to a major correctional institution from 1915 until 2001, originally the Ontario Reformatory with subsequent names including Wellington Detention Centre and, after 1972, Guelph Correctional Centre. The first inmates had been transferred to the Guelph facility from Toronto's Central Prison. The facility included a farm that taught inmates useful agricultural skills; inmates also learned dry cleaning, metalworking, and other trades. During World War I, the property served as the Guelph Military Convalescent Hospital a convalescent hospital for over 900 veterans; it closed as this facility in late 1920; prisoners returned in January 1921. In 1972, the centre still housed 450 prisoners but was then closed; the inmates were transferred to larger jails. Afterwards, the facility was used for some film shoots and for training emergency personnel. In December 2017, City Council voted to buy 98 hectares (243 acres) for subsequent sale to developers, including the area that was then the Turf Grass research building and the jail farm. The actual area around the buildings of the Correctional facility was not included. Guelph was the home of North America's first cable TV system. Fredrick T. Metcalf created MacLean Hunter Television (now part of Rogers Communications) and their first broadcast was Queen Elizabeth's Coronation in 1953. Other news-making items include the fact that the jockstrap was invented here, in 1922, by the Guelph Elastic Hosiery Company and that the man who invented five pin bowling in 1909, Tom Ryan, was originally from Guelph. Other noteworthy items: the city's covered bridge (now part of a walking trail), built by the Timber Framers' Guild in 1992, is one of only two of its type in Ontario, using wooden pins to hold it together. Note too that the Yukon Gold potato was first bred at the University of Guelph in 1966; it became available on the market in 1981. Guelph's police force had Canada's first municipal motorcycle patrol. Chief Ted Lamb brought back an army motorcycle he used during the First World War. Motorcycles were faster and more efficient than walking. The city is home to the University of Guelph, established in 1964, and Sleeman Breweries Ltd.. The Ontario Agricultural College (OAC), the oldest part of the University of Guelph, began in 1874 as an associate agricultural college of the University of Toronto. Guelph Collegiate Vocational Institute (GCVI), established in the 1840s, is one of the province's oldest high schools. Guelph has several buildings on the National Historic Sites of Canada register: the Basilica of Our Lady Immaculate, McCrae House and Old City Hall. The Former Canadian National Railways (VIA Rail/GO Transit) Station at 79 Carden Street was listed in 1992. In 2017, Scientology Canada announced it would move its Canadian headquarters to Guelph. Some residents protested the plan. The facility was opened in the autumn of the year at 40 Baker Street. A redevelopment plan for Downtown Guelph had been discussed by Council since 2007  and was finalized as the 2018 Baker District redevelopment project. The intent is to transform the Baker St. parking lot and properties fronting Wyndham Street's north end into a mixed-use development, with urban intensification. Both residential and commercial buildings will be included. The final cost was estimated at between $315 million and $369 million. When finished, this area will include a new library, commercial, institutional and office space as well as an underground parking lot. The private enterprise partner for the project is Ottawa-based Windmill Development Group; there was also discussion about an additional partnership with Conestoga College and the YMCA. Actual construction was not expected to start until 2023. Before that date, up to $7.5 million will be spent to acquire the rest of the land that will be required. In October 2018, the Ontario Energy Board approved the merger of Guelph Hydro and Alectra Utilities Corporation. After the merger was completed in January 2019, the City received a 4.63 per cent stake in Alectra and a one-time dividend of $18.5 million; afterwards, annual dividends would be received. The city has one permanent seat on the company's Board. As of May 2016[update], the population of the actual city was 131,794 according to the 2016 Census up from 121,688 in 2011. This report also indicated a metropolitan area which does not necessarily conform to the official boundaries. The so-called metropolitan area - including Guelph, Guelph/Eramosa and Puslinch - had a population of 151,984, an increase of 7.7 per cent since 2011. That made it one of seven in Canada to experience accelerated growth in the previous five years according to Statistics Canada. Downtown Guelph is situated above the confluence of the Speed River and the Eramosa River, which have numerous tributaries. The Speed River enters from the north and the Eramosa River from the east; the two rivers meet below downtown and continue southwest, where they merge with the Grand River (Ontario). There are also many creeks and smaller rivers creating large tracts of densely forested ravines, and providing ideal sites for parks and recreational trails. The city is built on several drumlins and buried waterways, the most notable being an underground creek flowing below the Albion Hotel, once the source of water used to brew beer. This region of Ontario has cold winters and warm, humid summers, falling into the Köppen climate classification Dfb zone, with moderately high rainfall and snowfall. It is generally a couple of degrees cooler than lower elevation regions on the Great Lakes shorelines, especially so in winter, the exception being on some spring afternoons when the lack of an onshore breeze boosts temperatures well above those found lakeside. The highest temperature ever recorded in Guelph was 38.3 °C (100.9 °F) on 6 August 1918 and 13 July 1936. The coldest temperature ever recorded was −37.2 °C (−35.0 °F) on 25 January 1884. The city of Guelph's diversified economy helped Guelph obtain the country's lowest unemployment rate at 4.2 per cent in 2011 and at 3.9 per cent in February 2016. The great diversity in the types of employers is a significant factor too; unlike Windsor, the city is not dependent on a single industry. The workforce participation rate of 72% was the best in Canada in December 2015 according to BMO senior economist Robert Kavcic. The job growth of more than 9 per cent at the same time was also of great value to the community. At the time, the BMO economist also rated Guelph as the top city in Canada for those looking for work. Over subsequent months, the rate increased steadily and the jobless rate was at a more typical 5.9% by October 2017, compared to 5.1% in Kitchener-Waterloo. The rate in June 2018 had decreased to 4.5%. By December 2018, StatsCan was indicating an unemployment rate of only 2.3%, down from 4% in November, and the lowest in Canada at that time. Manufacturing is the leading sector of the economy in Guelph, accounting for 24.3% of employment according to the 2006 census. The largest industry is auto parts manufacturing while the second largest industry is Educational services, accounting for 11.3%. Linamar is the city's leader in this sector, with 22 manufacturing plants. The company has received government funding for expansion that would create additional jobs, most recently in 2015 ($101 million) and in 2018 ($99 million). The latter would create 1500 additional job and maintain 8,000 others in the Canadian operation. According to research completed by the City of Guelph in 2010, Fabricated Metal Product Manufacturing accounted for 26.1% of the types of industries while Machinery Manufacturing for 12.8% and Miscellaneous Manufacturing for 10.4%. The City's Economic Development Strategy identified life science, agri-food and biotechnology firms, environmental management and technology companies as growth industries on which to focus economic development activities. The City encourages movie and television filming. Parts of many productions have been filmed here, including American Gods (released in 2017), 11.22.63 (2016) with James Franco, Total Recall (2012), Dream House (2011), The Heretics (2017), Dead Rush (2016) and Murdoch Mysteries (2013 and 2015). As part of the plan to increase development, City Council voted in late 2017 to buy 98 hectares (243 acres) south of York Street owned by the Provincial government, and previously part of the property of the detention centre. After the acquisition, the City would seek one or more developers to buy the property. The land purchased was only 23% of the long term plan for development in the entire 436 hectare (1,000 acre) site bounded by Watson Parkway South, the south border of the city and Victoria Road South. The City's Web site provided the following comment on the Guelph Innovation District Secondary Plan. The area "is vital to meeting employment and housing targets consistent with Guelph’s Growth Management Strategy and the Province’s Growth Plan; supporting an economic cluster focused on green-economy and innovation sector jobs; and offering opportunities for integrated energy planning as part of the Community Energy Initiative." The city scored well in fDi magazine's American Cities of the Future, 2017/2018, as one of the ten best small cities in North America for foreign investment. (The publication is a division of Financial Times Limited.) Cities were rated on economic potential, business friendliness, human capital and lifestyle, cost-effectiveness and connectivity. Guelph was the only Canadian city to rank among the top 10 overall in the small city category, coming in tenth on the list; it placed fourth in human capital and lifestyle, and eighth for business friendliness. The report indicated that the city continued to attract companies involved in advanced manufacturing, agri-food, environmental technologies, IT and tourism. The leading companies named in the report included Linamar Corporation, the Co-operators, Canadian Solar, Cargill Canada, Syngenta Canada, the Guelph Manufacturing Group and Blount Canada. Guelph is very attractive to the agri-food and biotechnology market sector, according to the City. It was ranked as the top cluster in Ontario and one of the top two in Canada. This sector includes over 90 companies in Guelph-Wellington, employing approximately 6,500 people. The City also touts the importance of advanced manufacturing which is its largest employer. The roughly 360 businesses of this type employ approximately 14,755 people (roughly 25% of Guelph's labour force). The category includes "high precision manufacturing and auto parts assembly to plastic injection moulding machines manufacturing and automation devices. This enables advanced manufacturing to be a strong driver of the local economy." According to the Bank of Montreal's fourth quarter 2018 report, Guelph was the leading city in Canada in terms of job growth and low unemployment. In January 2019, the city had the lowest unemployment rate in Canada. The 2016 Census indicated a labour force of nearly 76,000, of which about 55% said they worked full-time all year. At the time the data was gathered, 4,610 persons indicated they were unemployed. The top five occupations in terms of the number so employed were Sales and service (16,195), Education, law and social, community and government services (10,205), Business, finance and administration (10,150), Trades, transport and equipment operators and related occupations (9,170) and manufacturing and utilities (8,205). The City of Guelph's published 2016 data was sorting occupations in a different manner. In that report, Professional, Scientific and Technical jobs employed 39,141, Advanced Manufacturing employed 20,735, Retail and Service employed 11,345, Agri-Innovation employed 11,345, Culture and entertainment employed 7,711 and that Distribution, warehousing and wholesale employed 5,909. The Cooperators was one of the Platinum Winners in Canada's Best Employers 2017 report; the company has been on this list for 14 years. The University's staffing fell into three categories in 2015: there were 2,600 regular full-time faculty and staff, 1,890 temporary (full-time and part-time) and 3,690 student employees. The University was among Canada's Best Employers in 2016 according to Forbe's magazine, making the top 20 in the list. Two Guelph companies were among the 2018 winners of the Waterloo Area's Top Employers competition. According to the report, Reid's Heritage Group of Companies, a home builder with 212 full-time employees, "supports employees who are new mothers with maternity leave top-up payments .... [provides] flexible work hours, helps employees balance work and their personal commitments with up to 10 paid personal days ... and offers referral bonuses [for staff hires]." Sleeman Breweries Limited, with 991 full-timers, offers "generous tuition subsidies ... opportunities for the next generation to gain meaningful experience through summer employment and co-op placements ... retirement planning assistance and phased-in work options" as well as bonuses for salaried staff and profit-sharing for those who are unionized. In early 2011, those of Italian descent totaled approximately 20,000 according to one estimate. Many Italians from the south of that country, particularly from San Giorgio, had emmigrated to the area in the early 1900s, and also in later years. The 2016 Census indicated that 14,430 Italian Canadians lived in Guelph. Historically however, Guelph's population has been principally British in origin, with 92% in 1880 and 87% in 1921. Guelph is the fifth fastest-growing city in Canada with a population growth rate of about 2% per year. According to the Ontario Places to Grow plan, Guelph's population is projected to be about 144,500 by the year 2021 and 169,000 by 2031. The actual number of residents varies throughout the year because of variations in the University of Guelph student population. Between 1996 and 2001, the population of Guelph grew 10.7%. The 2011 metro population density of Guelph was 335.6 people per square kilometre. The 2016 census enumerated 131,794 residents of Guelph: 64,100 males and 67,690 females. Of these, 19,225 were 65 or older. The average age was 39.3. A full 60,400 people reported an education level of "Postsecondary certificate, diploma or degree". The most common occupations were sales and service, education, law and social, community and government services, business, finance and administration, trades, transport and equipment operators and related occupations and manufacturing and utilities. In 2015, the median income was $37,540. The city is mostly Christian (61.8%) according to the 2011 Census, almost evenly split among Protestants and Roman Catholics. The largest non-Christian religion is Islam (2.6%), followed by Buddhism (1.9%), Hinduism (1.5%) and Sikhism (1.0%). Violent crime severity index: 49 per 100,000 people compared to 75.25 for the national index. Homicide rate: The city had only one homicide in 2016 for a rate of 0.76 per 100,000 people, compared to the national average of 1.68. Sexual assault rate: This aspect was quite high with 64.22 per 100,000 people compared to the national rate of 56.6. Robbery rate: Guelph had 21.91 per 100,000 people, much lower than the national average of 60.9. Fraud: This aspect has increased notably since 1996; it was at 260.67 per 100,000 people in 2016, versus the national rate of 299.05. Drug offences: The city is well below the national average in all categories. Youth Criminal Justice Act offences: The rate was 8.31 per 100,000 in Guelph, substantially lower than the national average of 16.74. The 2017 Index showed a 15% increase to 64 per 100,000 people, still well below the national index. Much of the increase was in property crime and sexual assaults. Reporting of the latter type of crimes was up by up 42.7%. This may not indicate the actual increase in the number of sexual assault incidents, as theorized by Chief of Police Jeff DeRuyter. He told a reporter that "We are seeing an increase in sexual assault reporting, and that’s a positive, because we’ve always believed the reporting of sexual assault was under-reported." As of January 2019, the Chief of Police is former RCMP inspector Gordon Cobey who replaced Jeff DeRuyter who retired after 35 years of service with the Guelph Police Service. DeRuyter had been Chief since 2015, when he replaced Bryan Larkin who went on to head the Waterloo Regional Police force. Four school boards operate in the city. The Upper Grand District School Board administers all of Wellington County, as well as adjacent Dufferin County, while the Wellington Catholic District School Board administers Catholic education in Wellington County, including Guelph. The Conseil scolaire de district catholique Centre-Sud offers French First language education for students with parents who had elementary and secondary education in French at École Saint-René-Goupil. The Conseil scolaire Viamonde, with similar entrance requirements, operates the École élémentaire L'Odyssée. Conseil scolaire catholique MonAvenir operates the École élémentaire catholique Saint-René-Goupil. There are also numerous private schools in Guelph: Cornerstone Canadian Reformed Christian School, Resurrection Christian Academy, Guelph Community Christian School, Guelph Montessori School, Trillium Waldorf School, Wellington Hall Academy, and Wellington Montessori School, Echo Montessori. An International Baccalaureate Program is available at Guelph C.V.I. Our Lady of Lourdes C.H.S. University of Guelph, (with approximately 25,300 students) is one of Canada's top comprehensive universities, and home to the Ontario Agricultural College and the Ontario Veterinary College. Conestoga College has a small campus in Guelph. The original Carnegie library in Guelph. Although a private library, run by the Farmers and Mechanics Institute, existed since 1832, a public library did not open in Guelph until 1882, when the Free Libraries Act allowed municipalities to operate libraries. After occupying premises near City Hall, it moved into an Andrew Carnegie-funded building in 1905. 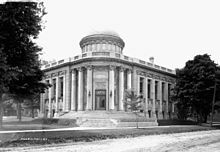 The neo-classical (Beaux Art) structure, had been designed in 1902 by W. Frye Colwill. The collection of the Farmers and Mechanics Institute library was contributed to the new library. The current main library building of the Guelph Public Library, on Norfolk St. was opened in 1965. Guelph is served by a growing library system composed of a main library located in the downtown core, five branches and a Bookmobile. With a membership of over 85,000, the Guelph Public Library system's goals include preserving and indexing public materials relating to the history of Guelph. Although no formal program has been developed, the library acquires municipal records of archival value from the City of Guelph. A new public library will be built near the Baker St. parking lot, which is to be redeveloped as the Baker District, starting in 2018. The City of Guelph operates Guelph Museums, including the Guelph Civic Museum which showcases the city's history with exhibits, an interactive gallery and special events; this facility has some 30,000 artifacts. Since 1983 when the city took over this facility, the Civic Museum has also operated McCrae House, the birthplace of Lieutenant-Colonel John McCrae (1872-1918), author of In Flanders Fields. The Museum also arranged for the restoration and placement of Locomotive 6167, a 1940s steam engine, which is located at the Guelph Central Station. The city currently has one hospital, Guelph General rated as one of the safest in Canada in terms of the hospital standardized mortality ratio; the lower the better. Guelph's facility had a score of 78 in 2017, notably better than the national average of 91. By comparison, Cambridge Memorial Hospital had a score of 95. St. Joseph's Health Centre was previously a hospital but is now a 240-bed long-term care home with a 91-bed specialty unit for complex continuing, rehabilitation and palliative care. Various outpatient services are also provided at this facility. Another major facility, Homewood Health Centre offers treatment for mental health and addiction issues. The facility was founded in 1883 by the Homewood Retreat Association of Guelph as "a private asylum for the Insane and an Asylum for Inebriates" on a 19-acre property which included the Donald Guthrie house. The first patients were admitted in December of that year. The city is a single-tier municipality governed by a mayor-council system. The structure of the municipal government is stipulated by the Ontario Municipal Act of 2001. There are currently 12 councillors and a mayor, with two councillors representing each of the six wards. The mayor and members of the city council serve four-year terms without term limits, with the next election in October 2018. Prior to the 2006 election, the mayor and city councillors served three-year terms. Guelph City Council is responsible for policy and decision making, monitoring the operation and performance of the city, analyzing and approving budgets and determining spending priorities. In 2014, Ward 4 councillor Cam Guthrie defeated incumbent Karen Farbridge, 50% to 36% for the position of mayor. Five incumbent councillors were re-elected, four rookie councillors were elected, three former councillors were elected, two incumbents were defeated, and four did not seek re-election. Sandals was named Ontario's Minister of Education in February 2013 and served in this role for three years. Subsequently, in 2016, she was appointed President of the Treasury Board. Guelph occupies a single provincial riding of the same name, and is currently represented in the Legislative Assembly of Ontario by Mike Schreiner, the current leader of Ontario Green Party. Guelph also occupies a federal riding of the same name. The member of Parliament is Lloyd Longfield of the Liberal Party of Canada. Downtown Guelph: Several downtown streets are lined with Victorian era buildings, which are now well over a century old. Many of Guelph's historically designated properties are in or near the downtown area. The old City Hall on Carden St., built between 1856 and 1857, is a National Historic Site of Canada; this structure is an example of mid-19th century Renaissance Revival architecture. This building, as well as the Annex built, in circa 1865, are also historically designated by the province. Other historically designated buildings in the area include the Winter Fair Building, the County Jail and Governor's Residence and the Guelph Armoury. The Old Quebec Street Mall was a street built in the 1800s that was enclosed and covered; that work was completed in 1984 and the street became an indoor shopping mall. 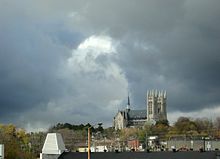 The Guelph Civic Museum has been located on "Catholic Hill" (Norfolk St. and Cork St.) adjacent to the Basilica of Our Lady Immaculate since 2012, moving to this location from a nationally designated historic site at 6 Dublin St. South. At Guelph Civic Museum one can find pictures, films and other antique materials related to the historical development of the City of Guelph. Among the oldest of the city's neighborhoods, settled by affluent citizens, the St. George's Park area features heritage homes and mansions in the highest part of Guelph. Much of the city's elite lived on the hill running up Grange Street and many of the homes have been renovated. The Exhibition Park neighbourhood, containing the oldest park in Guelph, is an area that was settled in the 1870s and still contains many Victorian style heritage homes. The Brooklyn and College Hill area south of the Speed River is the city's only district that was designated under the Ontario Heritage Act. St. Patrick's Ward (The Ward) with many old buildings, originally contained both manufacturing facilities and modest homes. Many newcomers from Europe, particularly Italy, settled here after 1850. Goldie Mill ruins: Once owned by the Goldie family, an important name in the early Waterloo Region, the mill was operated from 1866 until 1953 when a fire destroyed it. For some years, it served as a venue for outdoor public and private events but the area around the buildings was closed to the public in June 2017 due to soil contamination and sinkholes. Old City Hall, a formal, classical civic building; built in 1856-57. McCrae House, home of John McCrae, author of "In Flanders Fields". Basilica of Our Lady Immaculate, a Roman Catholic church designed by Joseph Connolly, located downtown, is a local landmark and a National Historic Site. 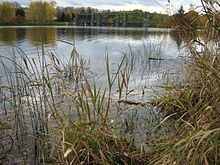 Most of the natural attractions of Guelph are located beside the two rivers which pass inside the city, Speed River and Eramosa River. The earliest newspaper published here was the Guelph Herald, which lasted for nine months after it was started in 1842 by Charles McDonnell. The Wellingtonian also lasted for only a short time in 1843. The next one to be published was The Advertiser in 1845. In 1847, the new Guelph Herald was established as a weekly. Both of those publications disappeared but the city was served by a daily newspaper for 149 years until the Guelph Mercury ceased operations in January 2016 due to declining subscriptions and revenues. At the time, it was owned by Metroland Media Group which also owned the Guelph Tribune, a twice weekly publication with limited news coverage. The latter increased its reporting of local news, assumed publication of the Guelph and District Homes section and, in April 2016, took over operation of the Mercury website. At the same time, the newspaper rebranded with a new title, Guelph Mercury Tribune. The city is served by two radio stations Magic 106.1, CIMJ-FM, featuring hot adult contemporary music branded as Today's Best Mix and CJOY, 1460, broadcasting an oldies format and branded as Greatest Hits. Both stations have been owned by Corus Entertainment since 2000. The University of Guelph station 93.3 CFRU-FM, Campus and Community Radio, has been broadcasting since 1980, currently at 250 watts. Radio stations from Kitchener-Waterloo and CTV Kitchener, CKCO-DT television, also provide some coverage of Guelph news. Since 2011, CKCO has not been identified by its call letters. The Sleeman Centre is a sports and entertainment venue in Guelph. The large, modern facility allows for a variety of events such as concerts, sporting and family events, trade shows and conferences, and it is home to the local hockey team, the Guelph Storm. From a Bell Organ factory to the opera singer Edward Johnson, Guelph has been a source of musical contribution. Today, Guelph has a thriving indie rock scene, which has spawned some of Canada's more well-known indie bands, many of which are highlighted in the annual Kazoo Festival. Guelph is also home to the Hillside Festival, a hugely popular music festival held at nearby Guelph Lake during the summer, as well as the Guelph Jazz Festival. Guelph is also home to the Guelph Symphony Orchestra, and two yearly classical music festivals. The Kiwanis Music Festival of Guelph showcases students from Guelph and surrounding areas, while the Guelph Musicfest offers performances by local professional classical musicians. 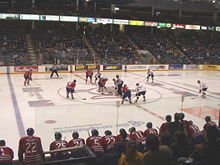 The Guelph Storm at home ice in 2006. Guelph Transit provides local transportation around the city. On June 20, 2007, Guelph Transit launched a web-based system known as Next Bus. Global positioning satellites (GPS) technology and advanced computer modelling provide riders via the Internet, handheld devices (including Palms, Blackberries, and Web-capable cellular phones), or their telephones to receive accurate, real-time arrival and departure information. Intercity connections by GO Transit and Greyhound Canada are made at the Guelph Central Station. Guelph was the first municipality in Canada to have its own federally chartered railway, the Guelph Junction Railway. This 25 kilometre (16 miles) link to the CPR is still municipally owned. Built in 1911, the Guelph Central Station (still in use), was constructed by the Grand Trunk Railway which had arrived in Guelph in 1856; years later, it was taken over by the Canadian National Railway. This is a classic example of early 20th Century Canadian railway station design and has been designated as a heritage structure per the Heritage Railway Stations Protection Act. The Romanesque Revival building, with its Italianate tower, has been listed on the Canadian Register since 2006 and was formally recognized as one of Canada's Historic Places in November 1992. A renovation project in 2016-2017 provided various benefits, including repairs to maintain and restore heritage aspects. There had also been passenger stations in Guelph that were built by the Canadian Pacific Railway. The first CPR station, from the 1800s, was the Priory House station, converted from the first house in Guelph. It stood opposite the current Priory Square and was eventually dismantled. Its replacement, located between Cardigan Street and the Speed River, was a brick building erected in 1911. After this brick building was no longer used as a rail station, it was converted for other purposes; eventually it was moved to the Galt area of Cambridge, Ontario. "Guelph Central Train Station is a busy transit hub that accommodates Guelph Transit, GO Transit, Via Rail and Greyhound Canada operations. Each weekday, more than 5,000 passengers board Guelph Transit, to travel on one of the 15 different routes that operate out of the bus bays adjacent to the train station." Highway 401 to Toronto and London. Highway 7 to Kitchener and Acton. The MTO has commenced construction of the Hanlon link to Kitchener, Ontario, a controlled-access highway running parallel to the existing Highway 7 from the Hanlon Expressway to Kitchener. Highway 6 to Hamilton and Owen Sound. This highway is known as the Hanlon Expressway for most of its length inside the city. ^ O'Keefe, Dan (Jan 28, 2010). "Monopolizing Guelph". Retrieved Jan 4, 2015. ^ a b c "Guelph (city) community profile". 2016 Census data. Statistics Canada. Retrieved 2008-12-16. ^ "City of Guelph territorial acknowledgement". City of Guelph. 2018. Retrieved 2018-12-31. ^ Pat, Montague (2010). "Historic Wellington County". WampumKeeper.com. Retrieved 22 March 2017. ^ Lee, Robert C. (2011). The Canada Company and the Huron Tract, 1826-1853. Hamilton, Ontario: Dundurn Books. p. 7. ISBN 978-1-89621-994-3. ^ "Canada's Best Places to Live". Canadian Business Online. Archived from the original on 2012-02-24. Retrieved 2008-03-18. ^ "Guelph recognized as one of Canada's top ten cities". Guelph.ca. 2009-04-16. Archived from the original on 2008-12-25. Retrieved 2012-02-20. ^ a b "Guelph unemployment rate drops even lower". Guelph Mercury. 17 October 2011. Retrieved 4 April 2015. ^ a b c Young, Leslie (April 8, 2016). "The little city that could: How Guelph got the lowest unemployment rate in Canada". Global News. Global News, Corus Entertainment Inc. Retrieved January 25, 2017. He pointed to the various manufacturing businesses in the area – Linamar, which primarily makes auto parts, is the city’s largest private employer. ^ "Crime stats put Guelph ahead in terms of safety". Guelph Mercury. 24 July 2012. Retrieved 4 April 2015. ^ a b "Latest crime stats show Guelph is losing ground as one of Canada's safest places to live". 24 November 2017. ^ "Serious crime in Guelph rose in 2017: StatCan". Global News. 26 July 2018. ^ Warren, May (14 October 2014). "Guelph honours Attawandaron Aboriginal territory at university, community events". ^ "The Attawandaron Discoveries - Museum of Ontario Archaeology". 10 June 2016. ^ a b c Stelter, G.A. "Guelph". The Canadian Encyclopedia. Retrieved 2008-03-18. ^ "History of Guelph". City of Guelph. Archived from the original on 2007-10-10. Retrieved 2008-03-18. ^ Reaman, George Elmore (25 March 1970). "A history of agriculture in Ontario". Saunders of Toronto – via Google Books. ^ Burrows, C. Acton (1877). The Annals of the town of Guelph, 1827 - 1877. Guelph: Herald Steam Printing House. p. 12. ^ a b c "Facts about Guelph". City of Guelph. Archived from the original on 2010-11-24. Retrieved 2010-11-11. ^ University of Guelph (2013). "International Handbook 2013" (PDF). Media Firabcn Spain. Media Firabcn Spain. Retrieved 25 March 2017. The city was named in 1827 to honour the British Empire’s King George IV, whose family name was Gwelf. The spelling has been altered over time, but it is pronounced just as it was 185 years ago and rhymes with ‘self’. ^ "Guelph, Rome, and the origin of a History Myth - Guelph Museums". 12 August 2015. ^ a b c Shelley, Cameron (2 July 2016). "Historic Priory residence ended up as firewood". ^ "Ontario Heritage Trust Founding of Guelph". Heritagefdn.on.ca. Archived from the original on 2012-04-03. Retrieved 2012-02-20. ^ Shelley, Cameron (2 July 2016). "Historic Priory residence ended up as firewood". Waterloo Region Record. Kitchener. Retrieved 22 March 2017. ^ Shelley, Cameron (6 March 2013). "Guelph in postcards". Guelph. Cameron Shelley. Retrieved 22 March 2017. ^ a b c "First house in Guelph: Built in 1827, now C.P.R. station, Guelph, Ont. : Virtual Reference Library". Toronto Public Library. ^ "The Guelph Historical Railway Association - About the club". www.ghra.ca. ^ "Significant Scots - John Galt". www.electricscotland.com. ^ Cattermole, William (25 March 2018). "Emigration, the advantages of emigration to Canada, the substance of two lectures" – via Google Books. ^ Smith, Wm. H. (1846). SMITH'S CANADIAN GAZETTEER - STATISTICAL AND GENERAL INFORMATION RESPECTING ALL PARTS OF THE UPPER PROVINCE, OR CANADA WEST:. Toronto: H. & W. ROWSELL. p. 72. ^ "About Guelph". City of Guelph. City of Guelph. August 25, 2016. Retrieved January 25, 2017. ^ "Guelph City Hall 1856". Wayne Cook. 1 March 1992. Retrieved 22 February 2019. This fine example of classical architecture was begun in 1856 following the incorporation of Guelph as a town. It was designed by William Thomas, architect of St. Lawrence Hall, Toronto, and other important buildings throughout the province, and was completed in 1857. Constructed of Guelph stone, it contained a market house, offices and an assembly hall in which many notable persons were entertained, including the Hon. John A. Macdonald, later Canada's first Prime Minister. Alterations to the building were made in 1870 and a new hall was added in 1875. Except for the clock tower which was removed in 1961, the front portion of the structure retains its original appearance. ^ a b Shelley, Cameron (19 January 2018). "James Massie: a mover and shaker in Guelph and beyond". ^ Account, Admin. "About Us". www.gghorg.ca. ^ "HistoricPlaces.ca - Our Lady of the Immaculate Conception National Historic Site of Canada". Canada's Historic Places. 2009-02-23. ^ "The Wellington, Grey & Bruce Railway". www.trainweb.org. ^ Stelter, Gilbert; Artibise, Alan F. J. (15 September 1982). "Shaping the Urban Landscape: Aspects of the Canadian City-Building Process". McGill-Queen's Press - MQUP – via Google Books. ^ "Charles Cooper's Railway Pages - Grey and Bruce Counties". www.railwaypages.com. ^ Gilbert Stelter and Alan F.J. Artubise (1982). Shaping the Urban Landscape: Aspects of the Canadian City-Building Process. Carleton University Press. p. 48. Retrieved January 28, 2019. ^ Burrows, Charles Acton (25 March 1877). "The Annals of the Town of Guelph, 1827-1877". Herald Steam Print. House – via Google Books. ^ "Family and Children's Services - History of Child Welfare in Ontario". www.fcsgw.org. ^ "The Poor House". www.wellington.ca. ^ Shelley, Cameron (13 July 2018). "Flash from the Past: How Guelph became the Royal City". ^ Saxon, Tony (14 December 2014). "Guelph's Church of Our Lady now a Basilica". ^ "Guelph Radial Railway". www.trainweb.org. ^ "The Guelph Electric Railway Company". U of G Library. University of Guelph. 2011. Retrieved 25 March 2017. ^ "April 22 - Canadian History Timeline - Canada's Historical Chronology". canadachannel.ca. ^ Norman Penner. "Communist Party of Canada - The Canadian Encyclopedia". Thecanadianencyclopedia.ca. Retrieved 2016-02-02. ^ "A gift to the city: Prison labour created much-loved ponds off York Road". 24 September 2011. ^ "Go directly to jail – no, not that one. The other one, say Guelph police". ^ "Abandonment Issues: Ontario Reformatory / Guelph Correctional Centre". jermalism.blogspot.ca. ^ a b McNaughton, Graeme (12 December 2017). "Councillors approve plan to buy, sell lands for Guelph Innovation District". ^ a b McNaughton, Graeme (1 December 2017). "City of Guelph looking to buy, then sell provincial lands". ^ "Former drop-in centre to house Church of Scientology". Kitchener. 2017-09-28. Retrieved 2017-10-10. ^ Lovell, Jessica (1 November 2017). "Church of Scientology says protesters don't represent Guelph". ^ staff, Mercury Tribune (30 December 2017). "Guelph in 2017: A Year in Review". ^ "Developer chosen for Guelph's Baker District project". Global News, a division of Corus Entertainment Inc. Corus News. 17 July 2018. ^ "Ottawa firm named Guelph's partner for Baker redevelopment". Guelph Today. 16 July 2018. ^ a b "City chooses green developer for massive Baker District project". Guelph Today. 16 July 2018. ^ "Guelph Hydro, Alectra merger approved". Global News. 2 January 2019. Retrieved 22 February 2019. ^ Hallett, Doug (9 February 2017). "Guelph posts big growth in new census". ^ "New census data: Population of metropolitan area of Guelph outpaced national growth rate". 8 February 2017 – via www.thespec.com. ^ "Guelph population growth stands out in census". ^ a b "Daily Data Report for August 1918". Canadian Climate Data. Environment Canada. Retrieved 7 August 2016. ^ a b "Daily Data Report for July 1936". Canadian Climate Data. Environment Canada. Retrieved 7 August 2016. ^ a b "Daily Data Report for January 1884". Canadian Climate Data. Environment Canada. Retrieved 7 August 2016. ^ "Guelph Arboretum". Canadian Climate Normals 1981–2010. Environment Canada. Retrieved September 22, 2013. ^ "Guelph OAC". Canadian Climate Data. Environment Canada. Retrieved 7 August 2016. ^ "Guelph Turfgrass". Canadian Climate Data. Environment Canada. Retrieved 7 August 2016. ^ "Daily Data Report for February 2017". Canadian Climate Data. Environment Canada. Retrieved 30 April 2017. ^ Babad, Michael (January 11, 2016). "Welcome to Guelph, Ont., pop. 121,688 and Canada's jobs powerhouse". The Globe and Mail. Toronto. Retrieved January 25, 2017. ^ Canada, Government of Canada, Statistics. "Labour force characteristics, seasonally adjusted, by census metropolitan area (3 month moving average) (Kitchener-Cambridge-Waterloo (Ont. ), Brantford (Ont. ), Guelph (Ont.))". www.statcan.gc.ca. ^ Lovell, Jessica (11 July 2018). "University degree may not be ticket to job in Guelph". ^ Canada, Government of Canada, Statistics. "The Daily — Labour Force Survey, June 2018". www150.statcan.gc.ca. ^ "Linamar gets $101 million from Ontario, Ottawa, to create 1,200 jobs - Toronto Star". ^ Seto, Chris (15 January 2018). "Guelph's Linamar to receive $99 million from feds, province". ^ "Linamar to launch $750-million expansion with help from Ottawa, Ontario - Toronto Star". ^ "The Focus on Sectors". City of Guelph. Archived from the original on 2008-06-05. Retrieved 2008-03-17. ^ "IMDb: Most Popular Titles With Location Matching "Guelph, Ontario, Canada"". IMDb. ^ "Top 5 Movies Filmed in Brampton". ^ a b "Guelph buying 243 acres of land from province". 12 December 2017. ^ "Guelph Innovation District Secondary Plan now in effect". 5 September 2017. ^ "Guelph Innovation District Secondary Plan - City of Guelph". ^ Hallett, Doug (12 April 2017). "Guelph makes top small city list for foreign investment". ^ "Ontario cities recognized as FDi Cities of the Future". 20 August 2015. ^ a b "Growth Sectors - City of Guelph". ^ "Top 5 occupations employing the most Guelph residents". 2 December 2017. ^ a b c d "Guelph Quicksheet - City of Guelph". ^ "Canada's Best Employers 2017: The Top 39 Large Companies". 10 November 2016. ^ "Facts and Figures". University of Guelph. University of Guelph. October 2015. Archived from the original on 2016-12-26. Retrieved 25 January 2017. ^ Dill, Kathryn. "Canada's Best Employers 2016". ^ "Top Employer: Reid's Heritage Group of Companies". content.eluta.ca. ^ "Top Employer: Sleeman Breweries Limited". content.eluta.ca. ^ "National Household Survey (NHS) Profile, 2011". 2.statcan.gc.ca. Retrieved 2016-02-02. ^ "Italian heritage celebrated in Guelph". 3 June 2011. ^ "The Ward Project - Una Presenza Storica: Italian Immigration and St. Patrick's Ward". thewardproject.omeka.net. ^ Craig Manley, Manager of Policy Planning. "Fact Sheet:Population Growth" (PDF). City of Guelph. Archived from the original (PDF) on 2008-04-08. Retrieved 2008-03-17. ^ "NHS Profile, Guelph, CY, Ontario, 2011". Statistics Canada. Retrieved 2017-06-21. ^ Graeme McNaughton (July 26, 2018). "Crime up in Guelph, Statistics Canada says". Guelph Mercury Tribune. Retrieved January 28, 2019. ^ "Guelph Public Library archival photographs collection". Guelph Public Library. Archived from the original on 2012-09-07. Retrieved 2008-03-18. ^ "The Carnegie Library". guelphpostcards.blogspot.ca. ^ "Our History". Guelph Public Library. Archived from the original on 2012-12-16. Retrieved 2008-03-17. ^ "New Guelph library will address the changing roles libraries play in a community". ^ "City to pursue Baker District redevelopment proposals - City of Guelph". 18 July 2017. ^ "McCrea House". Guelph Museums. ^ "Locomotive 6167". Guelph Museums. ^ Weidner, Johanna (1 December 2017). "Region's hospitals rank well on patient safety indicator". ^ "St Joseph's Health Centre Guelph - Long Term Care Home - wwhealthline.ca". www.wwhealthline.ca. ^ "Archives of Ontario". ao.minisisinc.com. ^ "Hon. Liz Sandals, Minister of Education". Edu.gov.on.ca. 2013. Retrieved 2016-02-02. ^ "Historical Walking Tours Return for August". guelpharts.ca. ^ "Designated heritage properties - City of Guelph". ^ "HistoricPlaces.ca - HistoricPlaces.ca". www.historicplaces.ca. ^ "Old Quebec Street Mall in Guelph-Downtown Guelph". ^ "Dublin Street South - 6 - City of Guelph". ^ "In Your Neighbourhood: St. George's Park (15 Photos)". ^ "In Your Neighbourhood: Exhibition Park (34 Photos)". ^ "Guelph area receives heritage conservation district status". ^ "Heritage Conservation District - City of Guelph". ^ "Cowan House merits historical designation". 19 March 2015. ^ "In Your Neighbourhood: The Ward (25 photos)". ^ "City of Guelph looks to historically designate mid-19th century tavern". 6 November 2017. ^ "Goldie Mill Park and ruins - City of Guelph". ^ "Faery Fest". faeryfest.com. Retrieved 2016-06-11. ^ "Guelph Youth Music Centre". Gymc.ca. 2015-11-21. Retrieved 2016-02-02. ^ "Guelph Mercury newspaper to close amid financial pressures" – via The Globe and Mail. ^ "Guelph Mercury quits print editions". 25 January 2016. ^ "Welcome to the new Guelph Mercury Tribune!". 28 April 2016. ^ "CFRU 93.3 FM". www.cfru.ca. ^ "Kitchener-Waterloo Ontario Broadcast FM Radio Stations information, listings and links". kitchener.foundlocally.com. ^ "Kitchener-Waterloo Ontario Broadcast AM Radio Stations information, listings and links". kitchener.foundlocally.com. ^ "CKCO-DT - History of Canadian Broadcasting". www.broadcasting-history.ca. ^ "About the Sleeman Centre - City of Guelph. Retrieved 30-10-2012". Archived from the original on 2012-09-27. Retrieved 2012-10-30. ^ "Guelph's Kazoo! makes a compelling case for small music festivals". Michael Rancic, A.Side. Retrieved 2018-02-05. ^ "Guelph Jazz Festival". Guelph Jazz Festival. Retrieved 2012-02-20. ^ "Guelph Symphony Orchestra". Guelph Symphony Orchestra. Retrieved 2014-01-12. ^ "The Kiwanis Music Festival of Guelph". Kiwanis Club of Guelph. Retrieved 2014-01-12. ^ "The Kiwanis Music Festival of Guelph". Guelph Musicfest. Archived from the original on 2014-01-12. Retrieved 2014-01-12. ^ "Member Leagues - Women's Flat Track Derby Association". Wftda.com. Retrieved 2016-02-02. ^ "City of Guelph". Guelph.ca. Archived from the original on 2012-02-08. Retrieved 2012-02-20. ^ a b Seto, Chris (19 April 2017). "Guelph Central Station is officially reopened". ^ "Fact sheet: Guelph Central Train Station". City of Guelph. April 11, 2017. Retrieved July 23, 2017. ^ "Guelph Via-GO". Ontario Heritage Properties Database. Archived from the original on 2011-07-06. Retrieved 18 March 2008. ^ Bean, Bill (3 October 2014). "CPR station's final stop mystery". ^ "The arrival of Guelph Central Station, 1911". guelphpostcards.blogspot.ca. ^ "Fact sheet: Guelph Central Train Station - City of Guelph". 11 April 2017. ^ Rob O'Flanagan (5 August 2015). "MTO says new Highway 7 build has begun". Waterloo Region Record. Retrieved 16 April 2017. ^ srl, Q-Web. "Gemellaggio con la città di Guelph - Comune Castelfranco Veneto". www.comune.castelfrancoveneto.tv.it. Wikimedia Commons has media related to Guelph.